Jacob and Timmy wore their Halloween costumes to school today. 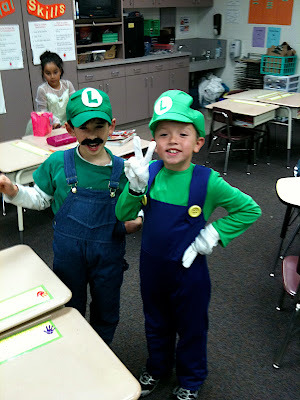 It turns out Jacob and another classmate both happened to have “Luigi” costumes. In fact, I got a picture of the two of them! The boys had a good time with their Halloween parade at school, and their respective Halloween parties. But after school Jacob asked if he could wear another costume to go trick or treating…his classmates told him he didn’t really look like Luigi as well as the other young man in the picture. Jacob also claimed that he never really wanted to be Luigi, but that simply wasn’t true. The boys were super excited all month at how easy it would be for Jacob to be Luigi because he was tall and skinny, and Timmy would be Mario because Mario is shorter and less-skinny. It was also evident the first two times he wore the costume, he was having a great time. At first I was ready to just run to the store and buy Jacob a polyester unitard of his choice…I guess Jacob’s getting to the age where individuality is going to be trumped by popularity. He’s getting older, and I think I’ve been lucky that he’s rarely expressed strong opinions in what he wore up till recently. I think he’d have felt better in the store bought version of the costume. In general, I’m still heartbroken. I may just have to absolutely turn Jacob loose with the choice/shopping/assembly of his costumes from now on…with zero input from me.